Ever since I first heard the Buddha’s teachings, some three and a half years ago, I’ve fantasised about the idea of taking a couple of monks sailing. The Buddha and his monks and nuns dwelt in the forests of northern India, and the branch of Buddhism which resonates with me is the one which sticks closest to the life which he advocated: a life verging on the ascetic, with the monastic members of the community still camping out in huts in the forest. 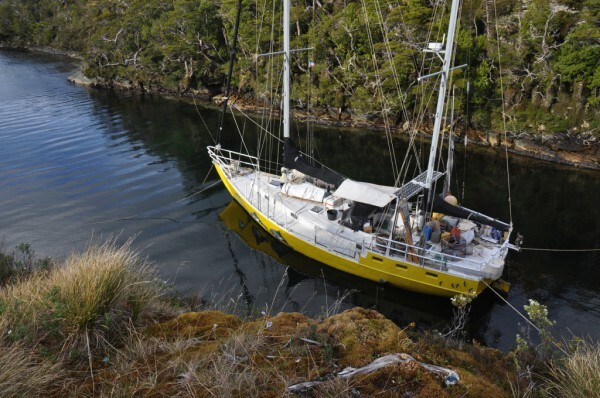 On the face of it, a small sailing boat would be the last place to suit a Forest monk – but, then again, the forest and the ocean have a lot in common. Both the forest and the ocean offer a refuge from the stress and distractions of uncivil civilisation; and both can also present the one who chooses to dwell there with life-threatening danger. The Forest monks of Thailand used to have to face tigers and elephants. 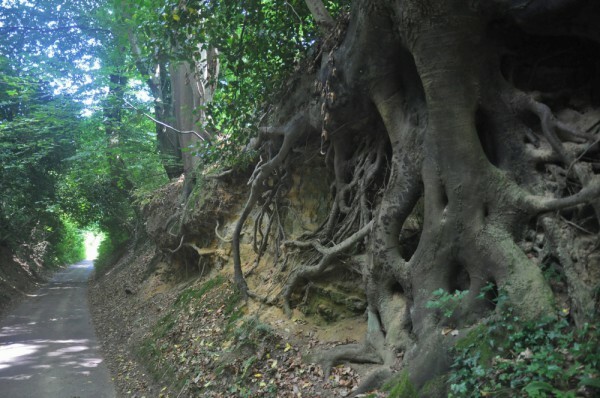 Both of these have now been largely eradicated, along with the forest, and the modern-day monks are left with nothing more scary than snakes and spiders. Perhaps they would welcome the opportunity to see how their minds performed while they were being bounced about in a gale? While I was visiting Wat Pah Cittaviveka, a couple of months ago, one of the senior monks mentioned the fact that Luang Por Sumedho is planning to visit Chile. … Buddhism is very thin on the ground in South America and thus I cannot imagine where he could possibly be planning to visit! If he is really going to come, then I would love to attend whatever retreat or talk he may be going to give. 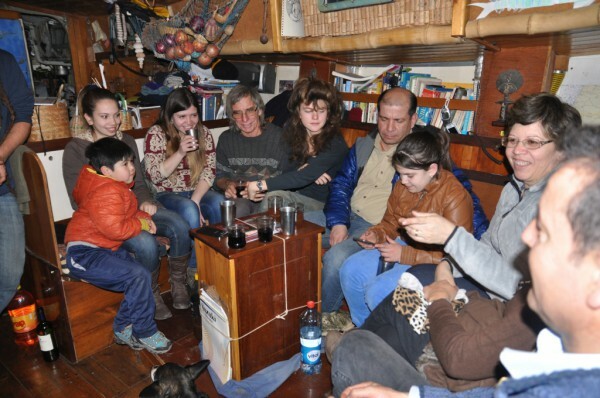 … If, during his visit, he should happen to want to make a trip around Cape Horn, my family and I would be delighted to be able to offer him a ride aboard our humble sailing boat. That last line was added on the spur of the moment, just before I hit the send button, and after the message had been released into the ether I wondered at my nerve. 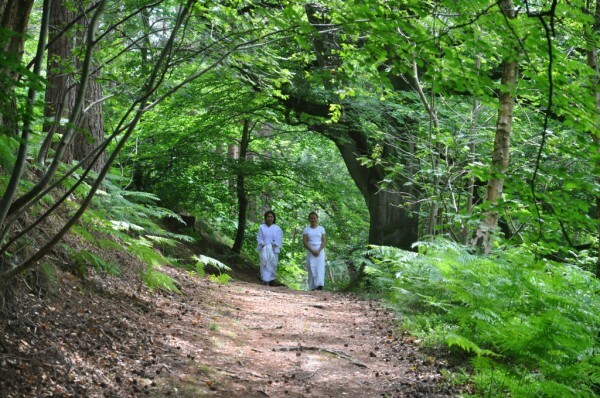 Certainly, I didn’t expect the invitation to be taken seriously, for after all, as I say, these are Forest monks. Besides preferring to dwell in the forest, they also take life very seriously – and that, too, is in accordance with the Buddha’s teachings. He urged his followers to make all haste in the effort of Enlightening themselves. To those who know nothing about it, swanning about on a yacht is generally seen as a frivolous activity, and a land-lubbing monk would surely reckon it to be at odds with his objective. I was forwarded your email regarding Luang Por Sumedho’s visit to Chile next year. Luang Por was immediately curious and interested in a chance to visit you and catch a glimpse of the Land of Fires. He has been to Svalbard over ten years ago, and would be thrilled to get a chance to visit the southernmost lands of the Earth as well. I read the e-mail with mounting astonishment. Then I pinched myself a couple of times. I shut the lid on the computer, I walked up and down the cabin a few times, and then I turned the thing on again. The e-mail was still there. Luang Por Sumedho became a monk almost 50 years ago, in Thailand. He’d travelled there in order to learn about Buddhism, and he ended up ordaining with a very famous, but very strict monk called Ajahn Chah. 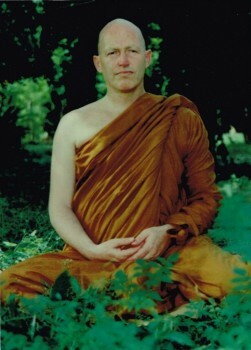 After he’d spent some years training intensively, Ajahn Chah sent him out into the forest to found a wat (or monastery) especially for English-speaking foreigners; and then he encouraged him to establish a monastery in the West. 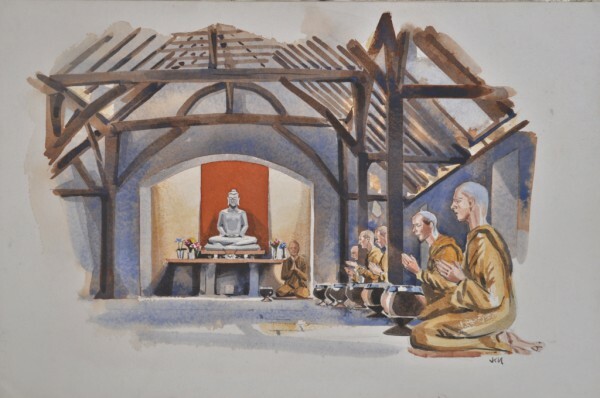 Since he’s an American, Sumedho initially anticipated founding a monastery there, but.. Well, to cut a long story short, he ended up founding Cittaviveka monastery, in southern England. And then he founded another monastery near London, with a retreat centre for lay people to learn about Buddhist meditation; and after that his disciples founded other monasteries – elsewhere in England, and also in America, Canada, Australia… there are two in New Zealand; I think there’s one in Portugal now; and there’s one in Switzerland; one in Italy… And Ajahn Sumedho – or Luang Por Sumedho as he’s now known – is the grandfather of them all. My offspring, having digested this information, looked at me with faces displaying total disinterest. “I should jolly well hope not!” said Caesar, as he turned his attention back to his computer. I can think of absolutely nobody who I would be more pleased to meet and to take sailing than Luang Por – and, of course, the idea of taking two Buddhist monks sailing is even better! All this having been said, I can see that there are certain things which we would need to resolve in order to make this happen. I will describe the layout to you: From the cockpit we descend four steps into the main cabin. The steps are quite steep, but I’m confident that Luang Por will be able to manage them as Nick’s father used to manage them when he was in his early 80s – and he was very fat and extremely unfit. To starboard, directly opposite the seats, there is a wood burning stove, and as I write, Nick is busy installing a diesel heater, too. Behind the heaters, on the starboard side of the boat is a very small cabin which is home to our son, Caesar. Caesar has accepted a job as skipper of one of the local charter boats, so he will not be with us during the time that you are aboard – so this cabin will be empty. If we now return to the companionway (which is that hatch leading down from the cockpit) we can explore the other half of the boat, which lies either side of the cockpit and aft of it. Taking a few steps to port we enter the navigation area, aforementioned, and we can peer into the little cabin which is aft of that. This is an incredibly untidy engine-room-come-workshop. Myself, I never go in there; it’s Nick’s domain. 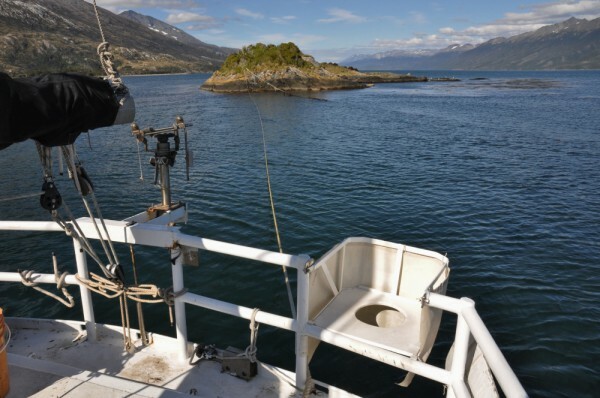 If we turn, instead, towards the starboard side of the boat, and we walk aft through the galley, we find that the equivalent space on this side of the boat is occupied by the bathroom. Well, we call it a bathroom… In any event, there’s a loo (or toilet) in there, and one day we hope to install a shower. On the far side of the so-called bathroom there’s a relatively large cabin. That is to say, it’s large relative to most yachts’ cabins – but it’s small relative to the average bedroom. This is my domain – it’s my studio-come-bedroom-come-meditation-space – and if you and Luang Por should decide that you really do have the time and inclination to join us aboard our very humble abode, this will be your private space for the duration. The bed is very big as yachts’ double beds go. It’s a lot smaller than King Size, but it’s big enough for two people to lie down without disturbing each other, and there’s room for two to sit and meditate. There’s also a table with a bench seat. Now you’re wondering where I will sleep while you are occupying this master suite. I will sleep in the forepeak or on one of the seats in the main cabin. As a matter of fact, this is where I’m sleeping at the moment because, as yet, there’s no heater in my den.…. When it’s minus 11°C / 15°F outside, it’s minus 11°/ 15° in there, too. That’s why Nick is now installing a new diesel heater. … The new heater is equipped with two radiators, one of which will be plumbed into the aft cabin. So – if you do decide to join us, you won’t freeze! I’ve told you all of this at great length because I want to make sure that you have a clear picture of the situation. I don’t want to put you off – far from it! – but nor do I want to delude you. “And that’s that,” I thought to myself. 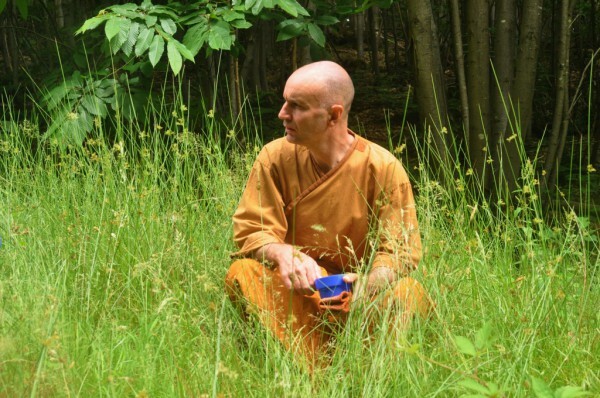 The life of a Forest monk is governed by a strict set of rules – 227 rules, to be exact – and they cover everything from not harming other beings, not taking anything that hasn’t been given, and not handling money, through to how to dress, where to sleep, and when to eat. These rules were not designed to simplify existence; they were designed to ensure that the follower is suitably renunciate, creates no more ‘dark kamma’, and lives in such a way as to be worthy of the generosity of the lay supporters who provide his food. Let me reassure you: we are not intimidated. Our acceptance of your invitation stands. How did I get to be so lucky!!? “This can’t be going to happen! This can’t be real!” To say that I was bowled over would be the understatement of the century. The greatest, most revered English-speaking exponent of the Buddha’s teachings was going to come and stay with me and my family in our humble cruising home – and for a whole week! For a whole week I would have the opportunity to be in the company of a man who is reputed to have attained Nirvana, and would have an unsurpassable opportunity to listen to his words and learn from his actions and attitudes. This absolutely could not be true! There obviously had to be a mistake. If the Buddha was right, and our lives are governed not only by the karma we make in this life but also by what went on before, then I can only assume that my previous incarnation was a thoroughly good, compassionate, and loving person. She or he must have lived a life much more worthy than the one pursued by this current “me”, because – through no doing of my own – I’m a very lucky person. Not only have I never been bombed or faced hunger and starvation (unlike some 75% of the world’s human population), I’ve also been blessed with good health, three marvellous kids, and a husband who introduced me to a marvellous lifestyle: the cruising lifestyle. But… to be blessed with a personal, week-long visit by Luang Por Sumedho…! To what can I compare it? To winning the lottery? Yes, that would be the nearest parallel; but I’d sooner have Luang Por’s undivided attention for a week than any amount of millions of dollars. Since I really didn’t believe that Luang Por Sumedho and Ajahn Asoko were actually going to pay us a visit – since I really didn’t believe that my luck could be that good – I did my best not to anticipate, or to look forward to the occasion. I did my best to stay grounded in the present. But I also made sure that we gradually worked our way through a list of chores which absolutely must be done in the unlikely event that the Great Happening really happened. At the top of the list was the installation of the radiator in the aft cabin; and then the cabin must have a door. And, ideally, the bathroom should also have a door. Having spent half my life without a door on the bathroom I’ve outgrown the British tendency towards reserve – and, indeed, it doesn’t take 25 years to throw it off. Most of our friends are other cruising yotties or back-packer types, and we’ve only ever had one visitor who was too shy to use either the door-less (but reasonably well-concealed) loo or to use our other convenience, which is a long-drop on the back of the boat. I also worried about the lack of washing facilities; and I worried that the aft cabin wouldn’t be up to Luang Por Sumedho’s usual standards. As cruising yachts go, it’s a real des res, but a senior monk is probably accustomed to something bigger and better. 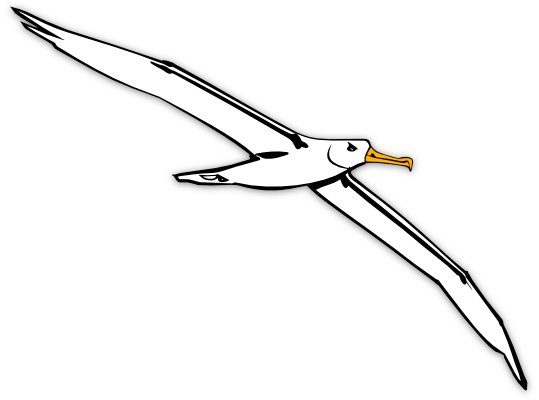 The weeks flew past, and we spent them sailing around the Horn and amongst the glaciers. 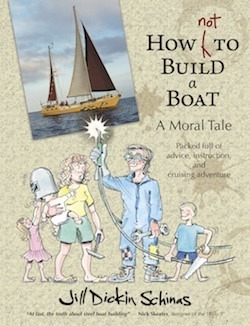 But all the while we sailed we also worked on the boat – and I also went on worrying. Most of all I worried about whether my cuisine would be up to scratch and – more than anything – whether I would have it ready to serve in time. In accordance with the rules set out 2,500 years ago by the Buddha, Forest monks generally eat only once a day and the meal must be taken after sunrise and must be finished before midday. I already knew that monks living in colder climes are also allowed porridge for breakfast; so, seemingly I had to prepare and present two meals between the hours of sevenish and elevenish. That ought to be easy enough for someone organised. But I’m not organised. If Ajahn Asoko were to be able to use Caesar’s little cabin then both this and the forepeak, where Roxanne and I would be sleeping, must have doors of some kind. Our previous guests have seemed happy enough sleeping in this communal space, but monks are different. The rules say that a monk may not lie down in a room where there is a woman. (This rule is said to have been introduced after a woman made an indecent proposal to one of the Buddha’s monks!) So, I made a thick curtain for the forepeak and I made another one for Caesar’s cabin, and I also made a set of curtains which could hang around one of the seats in the saloon – just to cover all possibilities. Instead there was one, sent a few hours earlier from Punta Arenas. It contained just three words and an exclamation mark: Half way there…! Follow the link to Part Two of this article, and find out how we got on. I wouldn’t rule out the Pope myself, I mean, he being an argentinian and all. Great story!